HONG KONG (Reuters) – The Chinese and Hong Kong governments condemned one of Asia's leading press clubs on Tuesday for hosting a speech by an independence activist that has sparked debate about the viability of the city's freedoms. 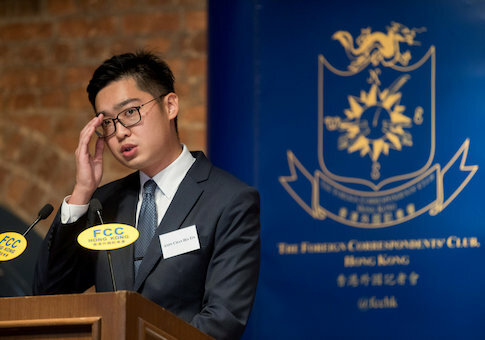 China's Foreign Ministry had urged the Hong Kong Foreign Correspondents' Club (FCC) to withdraw its invitation to Andy Chan, a founder of the Hong Kong National Party, part of the city's nascent independence movement which is now facing a possible ban from authorities. The FCC pressed on with the event. A number of Reuters journalists are FCC members. In his speech, Chan, who was dressed in a black suit and grey tie, said his ideals were no different than many of his fellow citizens in chasing "the dream of democracy". "If Hong Kong were to become truly democratic, Hong Kong's sovereignty must rest with the people of Hong Kong," he said. "China is, by its nature, an empire, a threat to all free peoples in the world," Chan added. China's Foreign Ministry said in a statement it "condemned" the FCC for hosting Chan and said there is a "bottom line" for freedom of speech. It said any words or actions that attempted to split Hong Kong from China would be "punished in accordance with the law" and that the FCC was "not outside the law". Hong Kong's chief secretary Matthew Cheung said it was "regrettable" that the FCC had provided a platform for Chan's views, which he said breached Hong Kong's constitution that says the financial hub is an "inalienable" part of China. The FCC, which has a membership that includes local and international journalists as well as senior lawyers and government officials, has long portrayed itself as a spirited institution fostering and defending free speech. FCC acting president Victor Mallet said the club has over the years neither endorsed nor opposed the diverse views of speakers. "The FCC does believe that its members, and the public at large, have the right … to hear the views of different sides in any debate," Mallet said. "We at the FCC, we fully respect the law and we champion free speech and freedom of the press across Asia." Some legal experts disputed that the speech violated Hong Kong laws. "Without an actual ban on the National Party under local societies laws, neither Chan nor the FCC appeared to have broken any domestic Hong Kong law," said Simon Young, a professor at the University of Hong Kong law school. "It presupposes there is a law that can be used to punish but it doesn't say what it is," he added. About 50 pro-China supporters rallied outside the historic FCC building, waving red China flags and denouncing Chan and the club through loudhailers as police looked on. "He's a traitor," said protester Jimmy Tso, who wore a black cap and T-shirt emblazoned with a China flag. Around a dozen pro-independence activists with banners supporting Chan were blocked by police from getting near the club's main entrance and the pro-Beijing groups. "I won't change my stance," said Chan, 27, acknowledging his calls for independence had angered some Hong Kong democrats who fear Beijing will crack down on all opposition groups. "Hong Kong faces national cleansing from China…We are on our own, and we are a nation that is quickly being annexed by China," he said. Hong Kong's mini-constitution, the Basic Law, states that the former British colony, which returned to Chinese rule in 1997, is an "inalienable" part of China. But Hong Kong operates under a "one country, two systems" agreement that promises it a high degree of autonomy and freedoms not enjoyed in China. The incident has opened a new battlefront over the city's relative freedoms compared with mainland China, as pro-establishment figures demand tough new national security laws that would likely curtail freedom of speech and association. The independence activists say separation from China would safeguard the city's freedoms from Beijing's tightening grip over politics, academia, the law and the media. Over the past two years, six pro-democracy lawmakers have been disqualified from public office and several young democracy activists jailed.